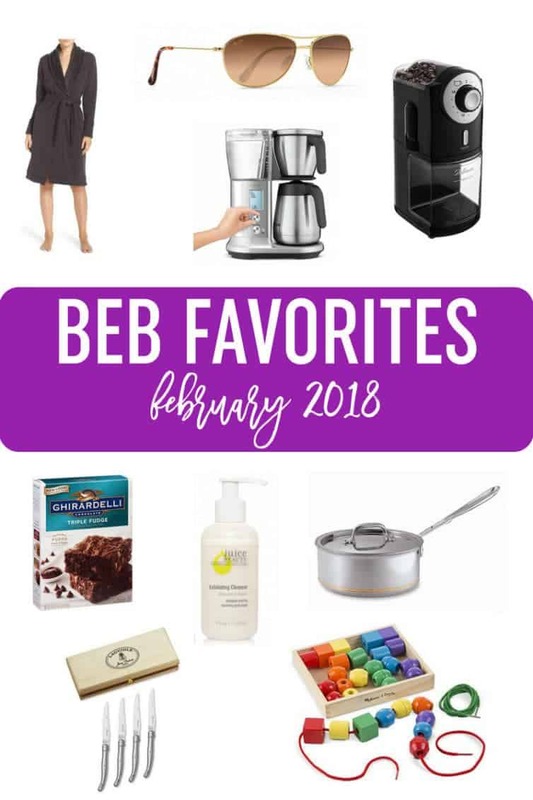 Welcome to the February installment of BEB favorites! UGG Duffled Double Knit Robe – My mom got this robe for me for Christmas, and I am IN LOVE with it. I went through two robes previously when each of the boys were born; the first one was too long for 5’1 me (tripping hazard on the steps) and the other was too thin and not warm enough. This one is a perfect length, the inside is fleece and the outside is super soft sweatshirt material. This seems to run big, since before I got pregnant I was wearing mostly size medium shirts, and this robe in a size small and still fits me at 8+ months pregnant! It looks to be sold out right now, but if it comes back or you can find it elsewhere, BUY IT! Maui Jim Baby Beach Sunglasses – Another Christmas gift (these were from my husband! ), and I adore them. He got me a pair of Maui Jim’s for a birthday six years ago, and they’re still going strong, but I had been wanting a pair of aviator sunglasses. The problem is that I have such a small face that most of them just look ridiculous on me. This “baby beach” model is perfect for small faces, and I love how light they feel on my face! Breville Precision Brewer Coffee Maker – We had been using a Keurig for years, but my husband (the primary coffee drinker at our house) was starting to want a more traditional coffee maker so we weren’t blowing through pods. We had the opportunity to try this one out and it is fantastic! There are many brewing options (including cold brews and single cups) and tons of tweaking you can do to create a totally custom cup of coffee. My husband said the coffee is infinitely better, especially since we’re now using freshly ground coffee beans. And on that note, my father-in-law swears by this Bellemain burr coffee grinder and got us one as well. It does a significantly better job than the cheapy plain grinder we had been using; you can select how finely to grind the beans, as well as the exact amount, which makes it perfect for grinding only the amount you need right then and there. A great, economical choice if you’re looking for a burr coffee grinder. I bake from scratch 95% of the time, but I keep some box mixes in my pantry for emergencies. Last weekend was the first time I’d used a brownie mix in YEARS, and oh my gosh, I fell in love! The Ghiradelli Triple Fudge Brownies are, hands-down, the best box brownies I have ever made. There will now always be a spot in my pantry for that box, thankyouverymuch. Juice Beauty Skincare – I first discovered this brand when I was pregnant with Dominic, as they have an entire line dedicated to healthy pregnancies, with products made only with ingredients that are safe to use while pregnant. I love the exfoliating cleanser, cleansing milk, soothing serum, nutrient moisturizer, antioxidant moisturizer, and smoothing eye concentrate. All-Clad Saucepans – A couple of months ago, I upgraded my old saucepans and bought new 2-quart and 4-quart saucepans, and am absolutely smitten. They heat so evenly and clean up wonderfully! Melissa & Doug Lacing Beads – Joseph’s school uses these and his teacher mentioned that pre-kindergarten and kindergarten teachers are noticing a general decline in fine motor skills, so they try to really work on them in his class and encourage parents to to do similar activities at home. Joseph LOVES these… he loves to thread the laces and then stack the different blocks and beads. Next Post » Easter Recipes! Thanks for the brownie mix recommendation. We agree. They’re delicious. No trip to grocery store for additional ingredients! YAY! So the triple fudge box is better than the triple chocolate box with the chips from Costco? Hi Bryn, I’ve never had the trip chocolate box with the chips from Costco, so I’m not sure! I have a pair of the Maui Jim Baby Beach and I love them. I also have a small face, which makes it hard to find sunglasses that fit right. Another great pair of Maui Jim’s for a small face, that;s not quite as expensive is Sandy Beach. I love BEB, and when looking for a new recipe to try or don’t have a favorite recipe , BEB is the first place I look. I LOVE the Ghirardelli Triple Fudge Brownies! Where were you able to get them?! They’ve become virtually impossible to find in stores, both in our old home and our new (CA->MN). Once they started showing up in our local Grocery Outlet store, I feared that the variety was discontinued. I’ve just savored my last box and was thinking I’d have to make my own with the Supreme variety and add in the chips myself. Hi Chrissy, My regular grocery store carries the Ghiradelli Triple Fudge! I hope they’re not on their way out! Love my All-Clad as well. Most of my complete set was purchased at the factory sale held twice a year, I think. The prices are fantastic and the ones I have show no flaws. I use All-Clad pans and Le Creuset pots/Dutch ovens and have had both sets for years and love them! I have a pretty sizeable collection of both and always have the right pan for whatever I am making. You cannot go wrong with either and they will last forever! If you love brownies, You should try the Trader Joe’s gluten free brownie mix ,you’d never know they’re GF. They’re some of the best brownies I’ve ever had! The lacing beads look perfect for my great-niece’s 2nd birthday. Thanks! You’re welcome, Martha! Hope she enjoys them as much as Joseph! I have only All-Clad stainless cookware and I absolutely love it. I can make anything in them and they do clean up perfectly. I also don’t like box mixes, but we’ve been using the Ghiradelli brownies for a while. They are so good it seems senseless to do brownies from scratch. Go for the Dark Chocolate version and don’t look back. They’re are so chocolately. We often mix in some walnuts with the mix for something different. I totally agree with you about the Ghirardelli brownie mixes. I am a huge home baker, but I never make brownies from scratch anymore. I will share a new find with you: Trader Joe’s Brioche loaf. I found a recipe for something called “Bostock” in Smitten Kitchen’s new cookbook. It calls for sliced brioche. OMG! Sooooo good. The TJs brioche is perfect for this. Your new pots are beautiful! Do you have to polish that little copper band, or does it stay shiny? Thanks Joan, I’ll have to check out that bread when I make it to Trader Joe’s! I haven’t polished the copper band at all, and it’s still shiny! I have to agree with you on the Ghirardelli brownie mix. I buy the big box of six pouches at Costco. I have to tell you, when I worked at a high-end Bakery in Cranberry, we actually used this brownie mix everyday for our brownie base. It was consistently perfect every single day. Customers raved about the brownies. We would Jazz them up with buttercreams and other toppings. Our best brownie, and one I still make to this day, is that brownie base, then a layer of peanut butter Buckeye filling, then a layer of chocolate ganache. I agree with you 100% on the All-Clad. Over the past several+ years I have been replacing my old pots and pans. (It’s been a slow endeavor as my husband gets me one for Christmas each year.). They are THE best cookware products around. In addition to those qualities you mentioned, All-Clad can even go from cooktop to oven. Their Dutch oven makes the best roast, always coming out tender and moist. I also love their cooktop griddle pan. Another benefit to this cookware is that I’ll never have to replace them; All-Clad is lifetime cookware. For someone who loves to cook, All-Clad is so worth the investment. And I love that they are made in the USA, close to Pittsburgh. If you ever get a chance to go to the All-Clad sale, you can pick up great deals on their cookware. I have some stainless steel pans and still great condition but I HATE cleaning those pans. Every single time, I use them, I have to use Bar Keepers Friend powder cleaner to make them shine but not cloudy looking. How about your new All Clad? How do you clean them? Thanks. I’m not sure how Michelle cleans her All-Clad, but sometimes I use Bar Keepers Friend on the interior of my All-Clad. It’s actually what All-Clad recommends, and I have to say it works perfectly with little elbow grease necessary. I just use plain old baking soda in my All-Clad pans if there is something being a bit stubborn to clean off. I have an old Pampered Chef shaker container that has a domed screen lid, (I can’t recall the exact name but I think it was a powdered sugar shaker) and I keep baking soda in it to make even-sprinkling easy. I use baking soda to clean my stainless steel sinks, too. Works great and is cheap! So funny you mentioned this because I texted my mom last night desperate for help, as one of my Le Creuset enameled pots got scorched and after soaking overnight and using Bar Keeper’s Friend, it still wasn’t coming out… and she said to use baking soda. I’m happy to report it worked very well! Kosher salt works perfect for scrubbing scorched food from cast iron and stainless steel pans. Yesss I use kosher salt exclusively for my cast iron! Hi Koffee, Mostly just Dawn and a scrubby, but once in a while (and when needed), I use Bar Keeper’s Friend. I use it on my enameled Le Creuset, too, when needed. I honestly don’t mind using it at all… it is an awesome cleaner and you don’t have to scrub very hard!